The Perdana Global Peace Foundation (PGPF), is deeply concerned with reports of what is described as a “human catastrophe of indescribable proportion” in relation to the aggression on the Rohingya, felt the urgent need to hold this conference to address the issue and propose solutions to it. The PGPF, very much like other civil society movements and humanitarian bodies, is deeply troubled with the recent developments in Rakhine and current reports from international agencies indicate that the crisis is showing no signs of dissipating, but instead intensifying. We strongly condemn these continuing acts of violence, rapes, beatings, burning of dwellings, killings and other inhumane acts perpetrated on the Rohingya. Since the United Nations itself has recognized the Rohingyas as being one of the most persecuted minorities in the world today, we cannot sit on the sidelines and allow these acts which are tantamount to ethnic cleansing be allowed to persist without undertaking efforts to oppose and put a stop to them. Adhering to the spirit and understanding of peace between member countries must be maintained vis-a-vis the ASEAN Charter; PGPF has organised this International Conference : “Plight of the Rohingya : Solutions?” at the Islamic Arts Museum Malaysia today for an insight on the crisis. YABhg. 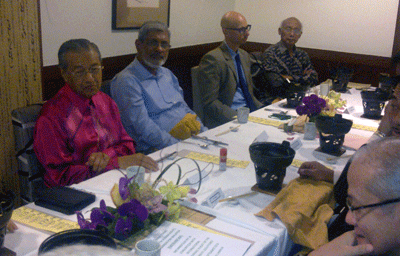 Tun Dr. Mahathir Mohamad, the fourth Prime Minister of Malaysia and President of PGPF, delivered the Keynote Speech. The Conference is divided into 3 sessions which will moderated by Y.Bhg. Tan Sri Razali Ismail, UN Secretary-General’s Special Envoy for Myanmar (2000-2005), Y. Bhg. Tan Sri Dr. Mohd. Rais Karim, acting Secretary-General PERKIM/former Vice Chancellor UPSI) and Y.Bhg. Tan Sri Ahmad Fuzi Abdul Razak (former Secretary-General Ministry of Foreign Affairs Malaysia) for each session respectively. The speakers are experts and renowned personalities including Mr. Nurul Islam (President of ARNO), Dr. Maung Zarni (Civil Society and Human Security Unit, LSE), Mr. Jacob Zenn (International Affairs Analyst, Washington DC), Mr. Benjamin Zawacki (former Researcher of Amnesty International), Mr. Matthew Smith (Human Rights Watch), Mr. Saiful Huq Omi (Research Consultant, Equal Rights Trust, Bangladesh), Dr. Sriprapha Petcharmesree (Human Rights & Peace Studies, Mahidol University Thailand and Dr. Abdullah Ahsan, International Movement for Just World (JUST) Malaysia. The Conference is attended by participants comprising representatives from the diplomatic corp, international organisations, parliamentarians, human rights groups, academia, civil society movements, non-governmental organisations, members of the media, as well as leaders of Rohingya organisations who are based in countries outside Myanmar. “It is indeed a collective and united call to action as part from calling upon the Myanmar authorities to acknowledge and resolve the crisis, UN and international agencies could very well play their part in ensuring their “responsibility to protect”, said Norian Mai, Chairman of Perdana Global Peace Foundation in his closing remarks.